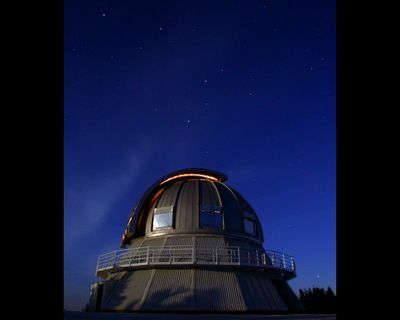 The Mont-Mégantic Observatory was opened in 1978 near Sherbrooke, Quebec. It was created to promote university-level astronomy education in Quebec, to provide qualified astronomers with state of the art research equipment, and to promote astronomy among French Canadian citizens. The telescope is equipped with a 1.6-metre mirror that weights one metric ton; the entire structure weighs 24 tonnes. The Mont-Mégantic Observatory houses the largest telescope in eastern North America, and the fourth largest in Canada after those of the David Dunlap Observatory in Toronto (1.88 metres), the Dominion Astrophysical Observatory in Victoria (1.83 metres), and the Rothney Astrophysical Observatory (1.8 metres). Although not the biggest, the state of the art instruments attached to the Mont-Mégantic telescope make it the most powerful telescope in Canada. The project to construct a large observatory in Quebec was launched in 1971 by professors Gilles Beaudet and George Michaud of the University of Montreal. Laval University in Quebec City joined the venture in 1974 and a partnership agreement was signed in 1975. The federal and provincial governments approved the project in 1976, and construction started the same year. The service building was completed in 1977, and the observatory several months later in 1978. René Racine joined the project in 1973 and became Director in 1976, the same year he left the University of Toronto to work at the University of Montreal. He remained Director until 1997 when he retired, with the exception of a short period from 1980 to 1984 when he took on the role of Director at the Canada-France-Hawaii Observatory. The observatory was involved in many research projects over the years, the most important of which concerned the relationship between galaxy dynamics and their abundance of chemical elements, the interactions between luminous stars and the interstellar medium, and the polarimetry of young stellar objects. A dynamic instrument program also accounts for a large part of Mégantic’s productivity. In 1982, Jean-René Roy, along with Yvon Georgelin and Jacques Boulesteix, designed a new Fabry-Perot interferometer for the observatory, and other pieces of equipment followed. In 1991, for example, the observatory became the first in Canada to use an infrared camera. Named MONICA (for MONtreal Infrared Camera), it was designed by Daniel Nadeau and René Doyon of the University of Montreal. 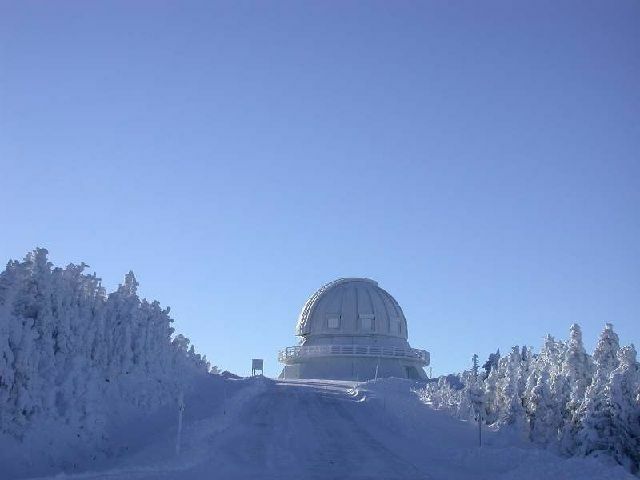 The site at Mont-Mégantic is particularly favourable for infrared astronomy because interference radiation levels are very low during the long cold nights in winter (sometimes even lower than the levels at Mauna Kea in Hawaii). 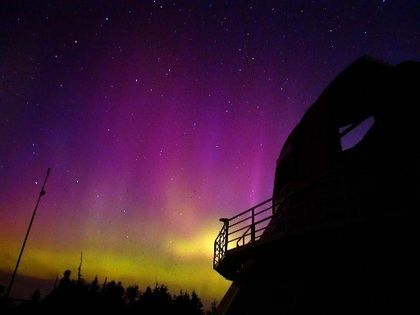 In 1996, the Mont-Mégantic ASTROLab, an astronomy activity centre, opened its doors to the general public. 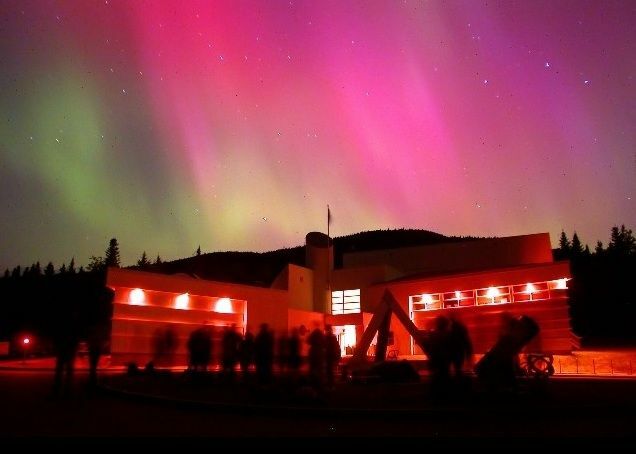 The centre hosts interactive displays, a high definition movie, multimedia presentations and access to two public observatories during open house astronomy evenings. Visitors can also tour the observatory and its 1.6-metre telescope during the day. In 1999, a major 3-year renovation program was started. First, the dome of the 1.6-metre telescope was repaired and equipped with a ventilation system. Then, in 2000, the observatory was linked to universities by fibre optics. A year later, the telescope controls became fully computerized and a new bonnet (the interface that allows instruments to be coupled to the telescope) was installed. Following this, a number of new state of the art instruments were also added to the telescope. In 2008, a team of research scientists including Christian Marois, David Lafrenière and René Doyon announced a major discovery: they were the first ones to photograph a trio of planets that orbit a star other than the Sun. These three exoplanets are five to ten times more massive than Jupiter and orbit a star named HR8799, located at around 130 light-years from the Earth. 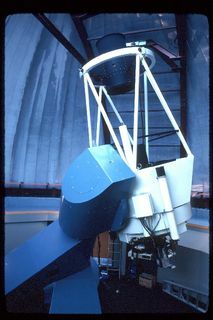 Although this discovery was achieved based on observations from Keck and Gemini North telescopes, angular differential imaging technique, used to directly photograph exoplanets, was developed and tested at the Mont-Mégantic Observatory. Observations undertaken in 2009 and 2010 by Christian Marois led to the discovery of a fourth planet orbiting HR 8799. In 2015, Université de Montréal and McGill University announced the establishment of the Institute for Research on exoplanets (iREx). The goal was to reunite the best research scientists in the field of exoplanets and be the first to discover Life Beyond Earth. To achieve this, researchers will have access to the Mont-Mégantic Observatory and other major telescope worldwide. Asteroid 4843 is named in honour of the observatory.